The reality TV star, fashion designer and bestselling author talks about her unusual career path and how she reinvented herself as one of the entertainment industry’s most successful brand names. It wasn’t too long ago that Lauren Conrad became a household name as the star of two MTV hit reality shows: Laguna Beach: The Real Orange County and its spin-off series, The Hills. Yet, just when audiences were embracing Lauren as a TV star, she left the show to embark upon a new and uncertain future. Those who assumed she would jump into another TV show were surprised when no such thing happened. In fact, except for a few cameos on shows like America’s Next Top Model, Who Wants to Be a Millionaire and Family Guy, Lauren really hasn’t focused her attentions on an acting career at all. Today, Lauren Conrad—the woman and the brand—is one of the most recognized in the fashion and entertainment industry. Going from reality TV to becoming a successful fashion designer and bestselling author may not be the most conventional career path, but for Lauren, reinventing herself to pursue her many interests seemed perfectly natural. Through her collaboration with Kohl’s, Lauren now designs for her own hugely successful fashion line, the aptly-named LC Lauren Conrad. She has also expanded her other business ventures, including her website, laurenconrad.com, and Paper Crown. And, just as her fashion career began to take off in 2009, Lauren somehow found time to write her first of eight books: the New York Times bestseller, L.A. Candy. Yet, even her writing career is the result of some typical twists and turns. Lauren reveals that she was initially interested in writing a book about dating. “It wasn’t so much of a ‘How To’ that I was picturing, but more of a ‘How to NOT,’” she says with a laugh. Her publishers, however, were more interested in Lauren’s own life story. 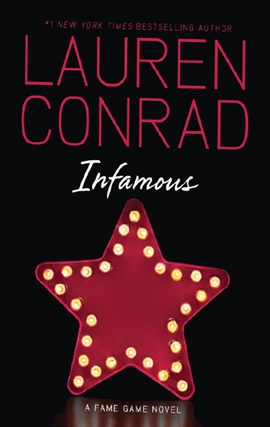 Lauren put aside her writing ideas and, instead, used her personal experiences on reality TV to write the L.A. Candy trilogy and the subsequent Fame Game series—the  final installment of which, Infamous, was released in June. Juicy, lively and engrossing, it’s no surprise the books have made Lauren a bestseller many times over. With such a hectic schedule, it’s difficult to fathom her even having time to write. “It’s a lot of writing where I can, when I can,” she admits with a laugh.